Gladstone Rd, Highgate Hill through to Annerley Rd, Dutton Park, eastbound into Laurier St, Annerley and into Victoria Tce, Annerley. Mains Rd, Sunnybank and Pinelands Rd, Sunnybank Hills. The project involved progressively excavating and isolating water pipes to carry out works. The results will be used to design a site-specific cathodic (anti-corrosive) protection system that will reduce risk of external corrosion and breakage on the mild steel water mains. This system will be installed in the future, with the community to be notified prior to works. The investigative works will be carried out in stages in each location, with timeframes and duration subject to weather and site conditions. Continuing to the southbound lane of Pinelands Rd, Sunnybank Hills, finishing just after the Pinelands Shopping Centre. 8pm-5am Monday to Saturday on the road. Some construction will take place on the footpath with working hours scheduled from 10am to 2pm, Monday to Saturday. Crossing Ipswich Rd and into the westbound lane of Victoria St, Annerley. 8pm-5am Monday to Saturday on main roads. Some construction will take place on residential streets from 7am-5pm Monday to Saturday. 7pm-5am on Monday 14 December and Tuesday 15 December 2015 (2 nights) on Laurier St, Annerley. Working hours will include both day and night works. A significant amount of night works are required from 8pm-5am Monday to Saturday, due to the conditions of our approved traffic permits which govern allowable construction hours on main roads. Some construction will take place on residential roads from 7am to 5pm Monday to Saturday and on the footpath with working hours scheduled from 10am to 2pm, Monday to Saturday. Changed traffic conditions during project work hours as work sites move along the project route, with traffic management in place to manage access. Please note, these works will not impact on traffic outside of project work hours. Water-filled barriers and the presence of fenced work sites during project work hours. Some noise and dust from open trenching, excavation and reversing beepers on construction vehicles and asphalting to restore the road surface. Our contractor will endeavour to do as much site preparation as possible early in the evening to minimise noise and noise levels are expected to diminish as they move past your property along the project route. 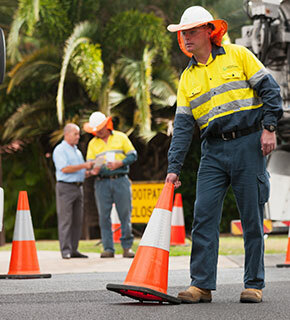 Queensland Urban Utilities is carrying out investigation and design work on a system that will extend the longevity of major water mains on Gladstone Rd, Highgate Hill, Annerley Road, Annerley, Mains Rd, Sunnybank and Pinelands Rd, Sunnybank Hills. The project involves progressively excavating and isolating water pipes to carry out works. The results will be used to design a site-specific cathodic protection system that will reduce risk of external corrosion and breakage on the mild steel water mains. This system will be installed in the future, with the community to be notified prior to works.